By Trophimos, Tryphon as well as Dorymedon. We have no information about them in the synaxaria, except that their synaxis was celebrated on September 29th next to the Church of Saint Anna in the Deuteron district of Constantinople. 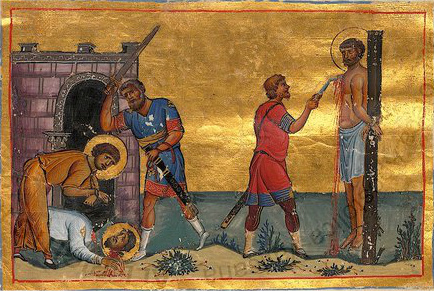 It may be that Trophimos and Dorymedon are the same Holy Martyrs commemorated on September 19th, who were martyred in Phrygia, and Tryphon was the same Holy Martyr commemorated on February 1st, who also was martyred in Phrygia. Perhaps their shrine in Constantinople contained relics of these three Phrygian martyrs.